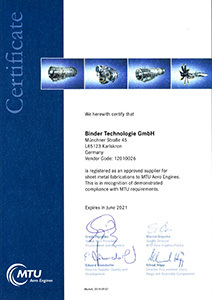 As leading supplier for Aerospace Industry we have high demand on our own performance and quality, which is proofed by relevant certificates. 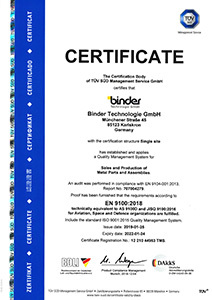 This quality management certificate is the basis for meeting our customers’ demands for quality and helps us to achieve continuous improvement. 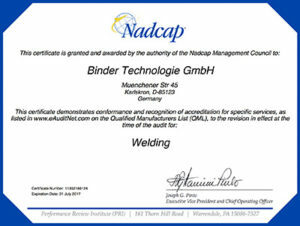 For fusion welding of steel, aluminum and chrome nickel steel we fulfill the requirements of the international management system DIN EN ISO 3834-2. Environmental protection is not an annoying cost factor for us, but an expression of our environmental responsibility. 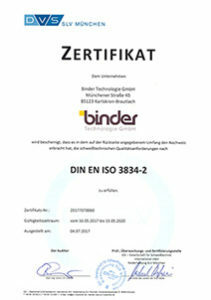 This is confirmed by our certification to ISO 14001:2015. Increased requirements of our aviation customers for the in-house special processes laser welding and TIG welding are fulfilled with the existing approval. 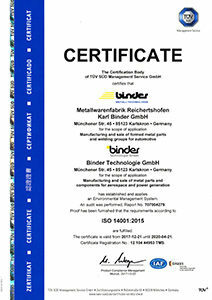 We are certified as an approved supplier for sheet metal fabrications to MTU Aero Engines.